Join us on September 21 at 5:30 p.m. at Unquarked in Los Alamos. These events are suitable for those of all ages. The Earth is a complex place. The field of biogeochemistry seeks to better understand the links between geologic, chemical, and biological processes. 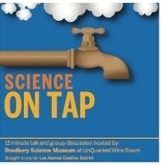 During this Science on Tap event, join Sharon Bone, of the Lab’s Inorganic Isotope and Actinide Chemistry group, who will talk about how molecular- and nanometer-scale tools can help us better understand how human activity has influenced the fate of toxic elements on a regional scale. She’ll also talk about what steps are being taken to use natural mechanisms to help clean up that contamination.